In a mixer, cream the goat cheese with the shallots, pinch of salt, and pepper. Divide the filling between the 12 crêpes and roll the crepes. Heat in a 350°F oven until the internal temperature is 145°F. Heat olive oil in a heavy-bottomed saucepan over medium heat. Sauté the onions and bell peppers; add the garlic, Creole seasoning, and remaining tablespoon salt. Cook 2 minutes, then add tomatoes. Deglaze the pan with the wine and add the heavy cream. Stir until smooth and continue to cook until the sauce clings to the back of a spoon. Add the crawfish tails, and break the butter into the sauce while stirring. 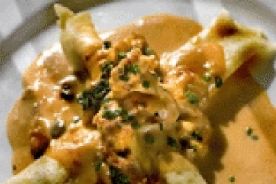 When crawfish tails are cooked through and butter is fully incorporated, remove sauce from heat.